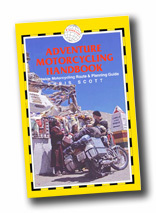 AdventureMotorcycling "Who's that cool dude on the front cover? ", you ask. Buy the book in spite of, or because of, the image of TheBrightStuff chatting up the local talent. The original, taken by yours truely is here. Benka Pulko There aren't many women who have been (ridden) there and done that. And Solo. Nice book. HorizonsUnlimited THE bike travel website. Rather than writing to me with questions, check this site and post a question on the bulletin board. Run by Grant and Susan. We love you! Ice Ride Rob and Dafne deJong. What a trip! Siberia. In winter! Great hosts too. Moto Frank Ann and Frank lived i and explored South America for 5 years.